Make sure to checkout my Table Top Video and Written Review for the Umarex Colt M45 CQBP Blowback CO2 BB Pistol where I show you around this Umarex Blowback BB pistol and go over its features and specifications. This Field Test Shooting Video Review focuses on the performance results of the Umarex Colt M45 CQBP Blowback CO2 BB Pistol. I put it through its paces to see what kind of velocity it can achieve as compared to the 400 fps Umarex claims on the packaging. I also perform my standard 10 shot accuracy test from 30 feet back to see how this action pistol groups on paper. My first portion of the test, the feet per second velocity test I performed using my Chronograph shooting five 5.1 grain standard zinc coated steel BB's with a brand new CO2. 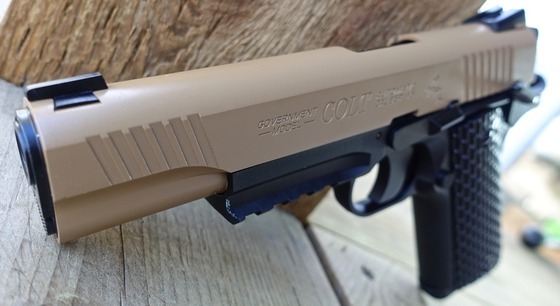 The fps for the Umarex Colt M45 CQBP Blowback CO2 BB Pistol ranged a little from 334 to 358 fps with an average 5 shot reading of 348 feet per second. Keep in mind the temperature was not exactly warm on this day, just a little over 10 Degrees Celsius so I was not anticipating top claimed fps readings so hitting about 50 fps under claimed may be a bout right, I know for sure on a hot summer day I can expect better results. Next up was the accuracy or shooting portion of this field test shooting review, I performed my standard 30 foot back paper target test using a semi rested stance standing in the back with a sandbag up front to rest my hands on for stability. This position is nice and stable but not perfect so there is always some human factor to take into account. Removing one flyer that was rather high, I was able to get a 3.5 inch grouping from my Umarex Colt M45 CQBP Blowback CO2 BB Pistol which is what I would consider about average for a blowback BB shooter, not the best but far from the worst I have shot. I am pretty sure I could do a bit better once I got used to the trigger as it does have a lot more take-up than I am use to with a 1911 and the release is a bit firmer. A couple of observation when shooting the Umarex Colt M45 CQBP Blowback CO2 BB Pistol. 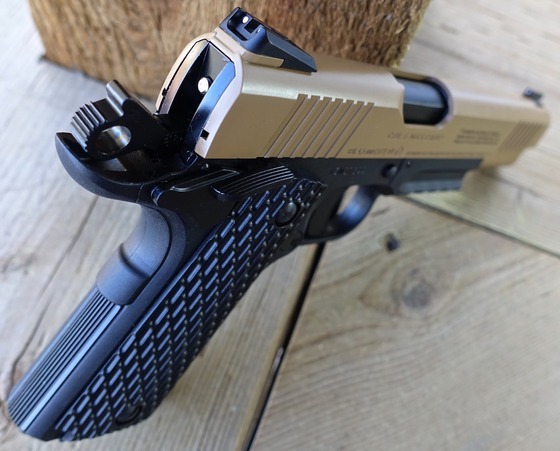 I found the trigger to be noticeably longer and heavier than a standard 1911 but at least it is single action and I would say usable once taking a little time to get accustomed to it. The break point is rather deep and the release can catch you off guard but again putting some rounds through the Umarex Colt M45 CQBP Blowback CO2 BB Pistol will work much of this out. The Blowback action is not overly heavy but certainly enough to give that recoil effect. I would also suggest only placing 15 rounds in the magazine as the load of the follower spring for a full magazine can play a little havoc with the trigger.